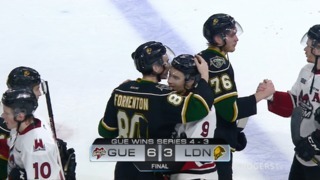 Evan Bouchard scored twice and added two assists as the London Knights beat the Guelph Storm 7-4 in Guelph last night in Game 3 of their OHL Western Conference semi-final. The victory allowed London to take a three games to none series lead and the four-point games allowed Bouchard to move four points ahead of any other player in post-season, scoring with 18 points in seven games. London assistant coach Dylan Hunter marveled at what the Knights captain did on the ice, but also off the ice. Adam Boqvist, Liam Foudy, Joey Keane and Alex Formenton all had two-point nights. 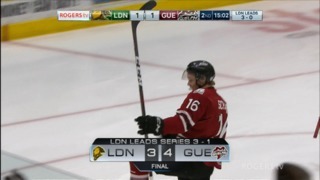 London was able to quash an early push from Guelph with Adam Boqvist’s eighth playoff goal on a power play just past the five-minute mark of the first period. They were able to stay at least that step ahead of the Storm for the rest of the game. The Knights went 2-for-6 on the man advantage. London managed to have quick responses to Guelph goals twice, as they scored 22 and 37 seconds after the Storm had shifted some momentum their way. The Knights scored their seven goals on only 22 shots. Jordan Kooy made 29 saves in net for London for his eighth consecutive win going back to the last game of the regular season. Game 4 is Wednesday night at 7:05 p.m. at the Sleeman Centre in Guelph. London’s power play got them on the scoreboard at 5:02 of the first period. Evan Bouchard fed Adam Boqvist on the right side of the Guelph zone and he wristed home his sixth goal on the man advantage and eighth goal overall, putting the Knights up 1-0. The Storm tied the game on a power play of their own just before the midway mark of the opening period. Dmitri Samorukov wristed a puck into the London net from the high slot on a 4-on-3 man advantage to make it 1-1. A response from the Knights took just 22 seconds. Joey Keane brought the puck across the Storm blue line, fed a pass to Liam Foudy and the Blue Jackets prospect hammered a one-timer past Anthony Popovich to give the Knights a 2-1 advantage. 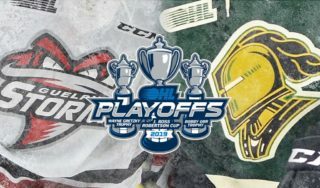 Kevin Hancock picked up his sixth point of the series as he fired in a rebound on an Evan Bouchard shot, on another London power play with just 3.6 seconds to go allowing the Knights to take a 3-1 lead to the dressing room. Samorukov’s second of the game at 4:22 cut into the London lead early in the second period, but fellow defenceman Will Lochead hammered a slap shot through traffic about six minutes later and London led 4-2. Once again, Guelph got to within a goal as Markus Phillips of the Storm picked up his first point of the playoffs, burying a puck that came out of a pile on the right-side boards in the Knights’ end. Evan Bouchard restored London’s two-goal lead 37 seconds later as he made a beautiful move of the left-side boards and slipped a puck between the legs of Popovich. Matvey Guskov gave the Knights their largest lead to that point at 6-3 as he finished off a play that featured two excellent passes from Nathan Dunkley and Connor McMichael. 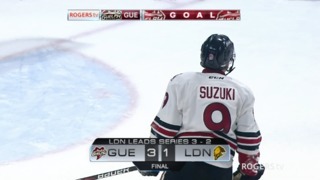 Londoner Nick Suzuki got Guelph back to within two goals in the dying seconds of the second period. In the third, Bouchard put things away as he carried a puck across the Storm blue line 1-on-3, moved to the right side and snapped a shot up high to finish the 7-4 score. Game 4 between the teams will take place on Wednesday at 7 p.m. in Guelph.